Previously, I remarked upon how those of us who were children in the 1980s “knew disappointment by name”, thanks to the deluge of new toy lines leaping at us from store shelves, most of them doomed to two-year lifespans and discount-bin futures. Companies were just beginning to learn how the lack of a Saturday morning cartoon could put an ugly dent in their profits. The hunt was on for the next best gimmick, the hook that would bring in the kids and establish the next He-Man or GI Joe. Not coincidentally, those lines were also infusing gimmicks circa 1987 in a losing battle to stay on top. So it was that in 1987 Hasbro began to try some new tricks. Here is but one example of something they threw at the wall with the greatest effort, and try as it might, it just didn’t stick. 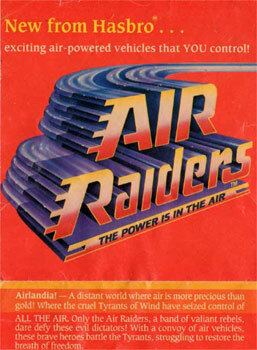 Ladies and gentlemen of the Internet, I give you Air Raiders. I don’t know why people are sad about the Great Deathwave of 2016. It’s a remarkable opportunity to make a stranger’s life all about yourself. 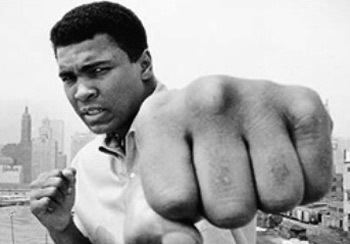 Muhammad Ali, The Greatest, 1942-2016. A multifarious and complex personality that’s tough to categorize (especially for a pugilist), not a prop for your opinions.